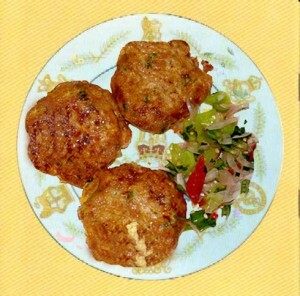 Aaloo Kay Kabab recipe by Uzma Aziz at DesiRecipes.com. 1 pound 1/2 Kg Potatoes. 2 tea spoons Red chillies. 1 tea spoon ground Corriander (Pisa houa shookha danya). Mash them and add salt , red chillies and coriender ground. Cut onions in very small and thin pieces. Also cut/chop green chillies and hara dhanya. Add them into the potatoes and mix all ingredients well.